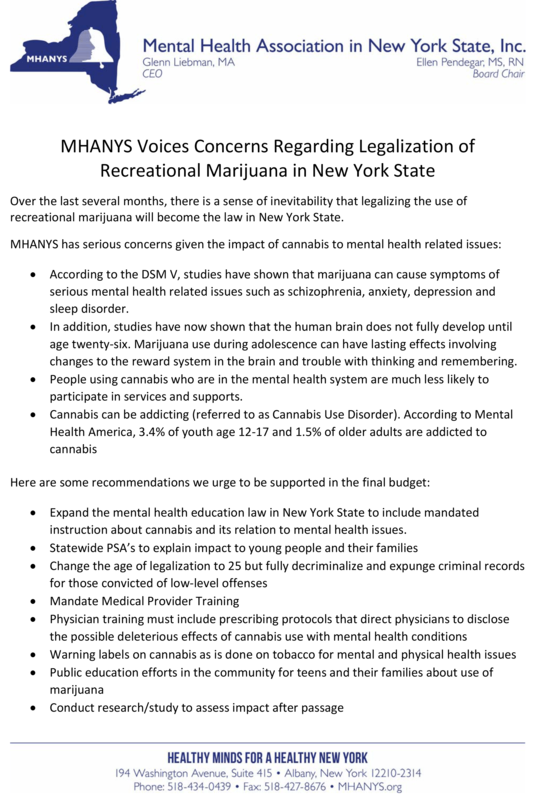 As New York moves forward in regard to legalization of recreational marijuana, MHANYS urges the State and the Legislature to be thoughtful and cautious in their approach. We have listed a series of concerns that might well impact mental health in regard to legalization of marijuana. In addition, we have provided a series of recommendations that should be included in any final implementation. Most importantly, we strongly believe that youth in schools and their parents must be educated about the impact of marijuana. We know from the School Mental Health Resource and Training Center that there is much misinformation about mental health among youth. The same is true about marijuana use. Let’s take advantage of this time to insure proper and appropriate education for youth and their families . We have also included a very thoughtful piece in the Albany Times Union in regard to legalization by Assemblymember Pat Fahy. We are much in line with her thinking on the topic. Support for legalizing recreational marijuana in New York appears to be “lit up.” Much of the support is justified, since justice has been sacrificed for too long in the name of protecting public health, so the need is long overdue to fully decriminalize marijuana and expunge criminal records for those convicted of low-level offenses. In the race to right these historic criminal justice wrongs, however, let’s not speed past some of the troubling negative impacts of marijuana legalization. Early research from states with legalized marijuana is raising many questions — particularly with regard to youth usage and impaired driving. New York was well served by the Legislature taking a cautious approach to the adoption of ride-sharing services, which resulted in the strongest protections for drivers and passengers in the country. In the same vein, the Legislature would benefit from exercising similar restraint on marijuana by aggressively addressing criminal justice wrongs while methodically addressing public policy concerns, particularly since this remains a cash-based business. The data on how marijuana legalization affects rates of use by minors is preliminary at best, yet troubling. Marijuana is different from many drugs; it does not cause symptoms of physical addiction, but produces addictive psychological effects in about 17 percent of teenagers who use it, according to an American Psychological Association study done in 1993 and replicated by the scientific journal Addiction in 2014. This matters not just because heavy marijuana usage is the most damaging to young brains, but also because research suggests that states with legal recreational marijuana have seen increased rates of heavy youth marijuana usage. The question is not, “Will more youth use?” but “Will youth use more?” While some studies have found little change in the numbers of youth using marijuana where it is legal, the Oregon Research Institute recently found that eighth-graders who had smoked marijuana smoked 26 percent more marijuana a year later after legalization. In Colorado, where the percentage of youths using marijuana has remained constant, the American Academy of Pediatrics found that the number of teens admitted to the hospital for marijuana-related reasons quadrupled after legalization — suggesting that legalization is enabling youth most inclined to use marijuana to consume the drug in higher, more dangerous quantities. The exponential rise in vaping among youth should elevate these concerns; another study by the American Academy of Pediatrics found that more than one in four adolescents who used e-cigarettes went on to use marijuana, while among non-users of e-cigarettes the rate was just 7 percent. Any measure to legalize marijuana in New York must aggressively address prevention and education. 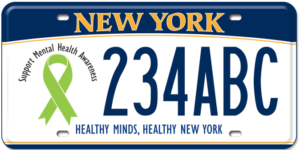 Impaired driving is one of the most serious problems facing New York, as it has been with states that have legalized the drug. In Colorado, the percentage of traffic fatalities where those involved tested positive for marijuana increased from 10 percent of fatalities to 20 percent a year after legalization. While that figure reflects only use, not impairment, the Insurance Institute for Highway Safety estimates that marijuana legalization has increased traffic accidents by as much as 6 percent in states that have legalized. States with legal marijuana depend on drug recognition experts (DREs) for enforcing impaired-driving statutes because there is no reliable scientific test for marijuana impairment. Blood tests can only confirm marijuana use in the recent past. The jump in traffic accidents along with the lack of a definitive measure for impairment makes this a critical public safety issue. DREs have had some success in cracking down on impaired drivers in states like California, but a reliable chemical test is urgently needed to be the standard for conviction. Legalization may have strong political headwinds, but politics should not outpace science. Just as rigorous debate on ride sharing led to the nation’s strongest protections for drivers and passengers, let’s make sure we are protecting our youth and our roads from risks still unknown. This is New York — once legalization hits here, the entire dynamic of the national debate changes, so it’s imperative we get it right on both the benefits and the drawbacks. Eyes wide open. Assemblymember Patricia A. Fahy, D-Albany, represents the 109th Assembly District.